Most of the seats are on the mainland, PRM president Ariffin Salimon announced today. 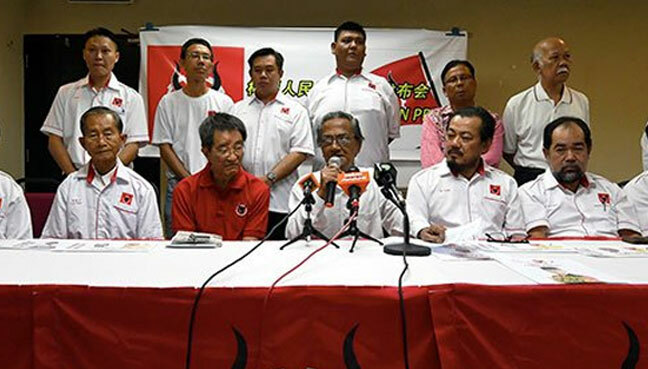 PRM president Ariffin Salimon announced the party’s candidates at a press conference today. BUTTERWORTH: Parti Rakyat Malaysia (PRM) will be contesting four parliamentary seats and 18 state seats in Penang in the 14th general election (GE14). This was announced by its president Ariffin Salimon in a press conference here today. The four candidates for the parliamentary constituencies are Azman Shah Othman, who will contest in Tasek Gelugor, Tan Lay Hock (Bagan), Tan Hiang Lye (Batu Kawan) and Samsuddin Yacob (Nibong Tebal). All four constituencies are on the mainland. The same candidates will also be contesting in state seats under the respective parliamentary constituencies, with Azman to contest in Permatang Berangan, Lay Hock in Sungai Puyu, Hiang Lye in Bukit Tengah and Samsuddin in Sungai Acheh. Two former journalists, Chua Cheong Wee and Chew Seng Tung, will be fielded in the Tanjung Bungah and Pengkalan Kota state seats respectively. Both constituencies are on Penang island. Former Kedah PKR exco Tan Chow Kang will contest in Sungai Bakap, located on the mainland. PRM will also field candidates in the following state seats: Penaga, Telok Ayer Tawar, Bagan Dalam, Bagan Jermal, Berapit, Machang Bubuk, Padang Lalang, Perai, Bukit Tambun, Jawi and Bayan Lepas. PRM previously announced its intention to be a third force in Penang as it attempts a comeback following a long political hiatus. Its former state president Gary GV Nair recently filed a complaint with the Registrar of Societies (RoS), claiming there had been a breach of the party’s constitution. He also claimed that decisions were made without the support of party members.